I have decided to broaden the subject of this blog a little bit. Yes, I know, I have barely started with my lyrics analysis, but I already realized that I feel a little bit limited when it comes to talking about animation. So instead of starting yet another blog (I am barely able to do regular updates for the ones I already have), I have decided to use this one for some serious basic discussions about animated movies – and start with the basics. When people talk about the History of Animation, most of the time they really talk about the History of American Animation. And if the topic is theatrical movies and not animation in general, that is for once fairly legitimate. Like it or not, but when it comes to animated movies, the US is dominating not only the home but also the European market. I guess this is the moment I should talk about animes. They naturally have their own history and influences. Let’s concentrate on one side of the earth for now. I intend to illustrate something by doing a small overview over the most important development in animation. The first theatrical animated movie in the world was – no, not “Snow White and the Seven Dwarves” – an Argentinean movie with the title “El Apóstol”. Released in 1917 it utilized cutout animation (basically a special form of stop-motion). The movie is lost, but based on what I read about it, it was a satire which was certainly not geared towards a young audience. The feathers and leaves are already impressive, but it is even more impressive if you see it in motion. As you can see, the movie is tinted. It also has its own “soundtrack”, composed specifically for it. The movie has been restored in 1999. It is now available on DVD and has even shown with life-orchestra from time to time. If you get the chance to see it life – do! It’s a once in a lifetime experience, for multiple reasons. The first stop-motion movie using puppets is either of Ladislas Starevich’s “The Tale of the Fox” or the Russian movie “The New Gulliver”, depending on if you base it on the end of the production or release date. 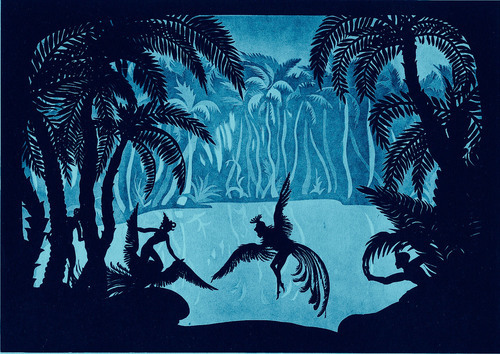 “The Tale of the Fox” was finished in 1930 in France but released in April 1937. “The New Gulliver” was finished and released in 1935. The first animated sound film was – nope! Still not “Snow White and the Seven Dwarves” – but another lost Argentinian movie, “Peludópolis”, released in 1931. The claim which “Snow White and the Seven Dwarves” has to fame is that was it was the first full-length cell-animated feature filmed in three-strip Technicolor, and begin of the rise what we call nowadays traditional animation. Released in 1937, it was the seventh animated movie ever made. From that point onwards, you can just as well call it the history of Disney. First stereophonic sound? Fantasia (1940). First widescreen format? Lady and the Tramp (1955). First movie using the xerography process? 101 Dalmatians (1961). From 1937 onwards Disney was dominating the market – and then became complacent. Between Walt Disney losing interest in the Animation Studios and the general lack of a proper rival, Disney stopped being the pioneer in animation. I think Disney left gladly the crown for the first “adult animation” to Ralph Bakshi’s “Fritz the Cat” (1972), but the studio also got beat concerning the first animated feature in Dolby Sound by “Watership Down” in 1978, the honour of being the first animated feature using computer images went to “Rock and Rule” in 1983, and the first feature length clay animation movie was “The Adventures of Mark Twain” in 1985. Then Disney woke up again, setting a new milestone with “Who framed Roger Rabbit” (1988) and then proceeded to perfect the CAP system. “Rescuers Down Under” (1990) was the first movie produced without a camera and with only digital ink and paint. In 1995 Pixar happened. Toy Story was the first fully computer animated feature film and Toy Story 3 (2010) was the first feature film released theatrically in 7.1 surround sound. Meanwhile there was development in stop-motion, too. Coraline (2009) was the first stop-motion movie which used rapid prototyping. There are two point I want to illustrate with this: Disney didn’t invent animation (not by far), but it was over long periods the forerunner in traditional animation. Also, the world of movie animation is all in all pretty small. The Disney Animation Studios – naturally. Forerunner in traditional animation and currently on the top of their game in CGI, too. Also the first animation studio which started making animated movies on this list active since 1937. Pixar – Forerunner in CGI animation, now naturally part of the Disney Company, but still an independent subsidiary. Active since 1995. DreamWorks – mostly notable in being currently the biggest rival of the two studios above. Don Bluth – His movies are a little bit hard to pin down to one studio, because he went bankrupt multiple times. At one point he was working with Steven Spielberg, later Fox Animation (which is nowadays Blue Skies). So, technically not a studio, but a notable body of work, and a player on the field from 1982 to 2000. Jiří Trnka – A pioneer in stop motion animation. Between 1947 and 1959 he made six critical highly acclaimed movies. The Czechoslovakian was considered by many the “Walt Disney of Eastern Europe” even though his style was very different. Aardman Animations – specialised on stop-motion and therefore in a niche market the US companies mostly ignored for a long time, this British Studio has been around since the 1970s. Its activity in movie making started in 2000. Blue Sky Studios – owned by 20th Century Fox this studio pushed into the market in 2002 with Ice Age. Robert L. Zemeckis – he worked on different projects on different companies, but is mostly notable for being the expert in motion capture, especially since the release of “The Polar Express” in 2004. If this is proper animation or not is disputable, but it certainly goes hand in hand with animation. Laika Entertainment – founded in 2005 this studio has still a fairly small line-up, but with releases like “Coraline” and “Paranormal”, as well contract work for “Corpse Bride” under its belt, it certainly left its mark already. Steven Spielberg – It is easy to overlook since he is not an animator, but he has been involved as executive producer to some of the most noteworthy animated movies made since the 1980s (and one or two really forgettable ones). This list includes “An American Tail”, “The Land before time” and “Who framed Roger Rabbit”, though he is currently mostly dabbling in motion capture. Warner Brothers Animation – despite the “big name” overall fairly unimportant in terms of movie making, since the company mostly concentrates on shorts and Television Series. But it is the only animation studio which has been around just as long as the Disney studios. Since 1993 the studio has been dabbling in movie making, too, and while the Lego Movie is the first one, which has been a true box office success, it does have a few other critical acclaimed pieces in its line-up, including “The Iron Giant”. Ralph Bakshi – His movies are a little bit out of the realm of the other studios, since he has a different target group at all. Since 1972 he is creating movies with the intent to address the adult audience – with varying success. To be honest, I think if any of the other studios had a true interest to outshine him, they would do so quite easily, there is just nobody else truly interested in doing animation which is exclusively geared towards adults if they can do a way bigger cash grab with movies made for all age groups. The early beginning of movie animation. At this point the movie makers from all over the world experimented with different variants of stop-motion. But with only three animated theatrical features overall, animation didn’t really take off in movies – yet. Even before the rise of Disney, the concept of animated movies notably took off. Aside from the ones I already mentioned above, there were additional movie projects which never got finished and are considered lost. The Golden Age also saw not only the rise of Disney, but above all the rise of traditional animation. Stop motion still continued to thrive in Europe and especially Czechoslovakia, but in the US it was mostly used for shorts, TV shows and above all, special effects in live in live action movies. A dark time indeed. Disney is more or less the only company out there which is still regularly producing animated movies. There are some smaller projects, some of them certainly remarkable, but overall, the animation landscape has become empty, and Disney is doing just enough to not totally embarrass the studio. This only changes in the 1980s, when Don Bluth starts to challenge the status quo. But not only this. Computer technology changes animation forever. Multi, because this is the most diverse era for in animated movies so far. Traditional Animation raised to new heights, stop-motion managed to push its way back on the map, CGI movies stormed the market and motion capture became a thing. And if you look at the list above, most animation companies listed there are active in movie making since the 1990th or 2000th. For the first time ever there is proper competition for Disney. At this point the Multi Age might have been over already, since CGI keeps pushing other methods, especially traditional animation, out of the picture. We’ll see in a couple of years. And this concludes my first overview. The history of the most important animation studios is another theme though, which I will discuss separately.